This morning my pal Dave told me the sad news, the mighty Moebius (Jean Giraud) has passed away at the age of 73. Relative to his sprawling career, I’m a fairly new fan of his work after my buddy Cal gave me his book Made in L.A. That book has been a constant source of inspiration and Moebius’ work was never far from my radar after that. Instead of putting together a big post with a ton of his art, instead I scanned in my favorite piece from the book, created by Moebius in 1986. 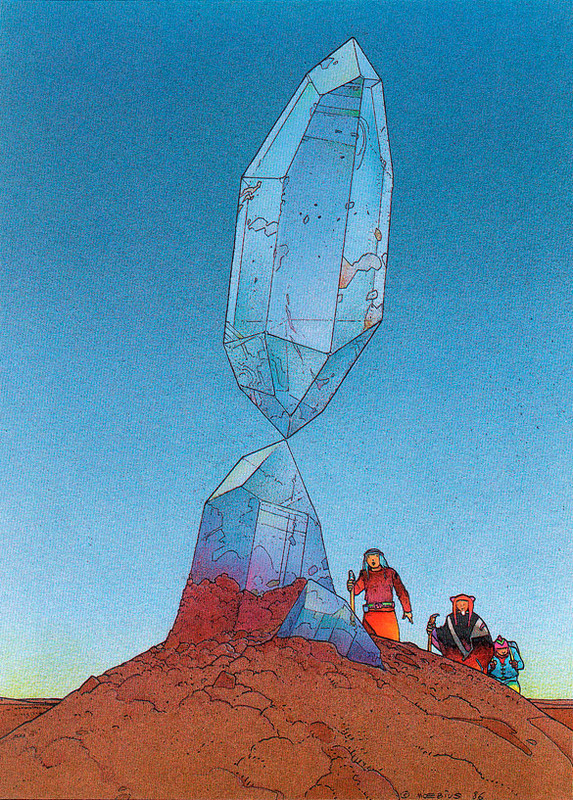 I don’t know what it’s called or what it was produced for, but to me this piece captures perfectly the calmness and other-worldly nature often present in Moebius’ work. It tells a story with a simple illustration and has trademark linework only he could produce. Just love it. Please pardon the scan quality, my scanner doesn’t treat halftones very well. Moebius and his work will be remembered forever as it continues to inspire illustrators everywhere. That’s sad. When I was 16, I had a Wizard™ magazine that had an article on him, and I was blown away. If you can’t find a painting (drawing?) of Spider-man that he did, let me know, and I’ll scan the image and email it to you. It’s really cool, and has stuck with me for over a decade.